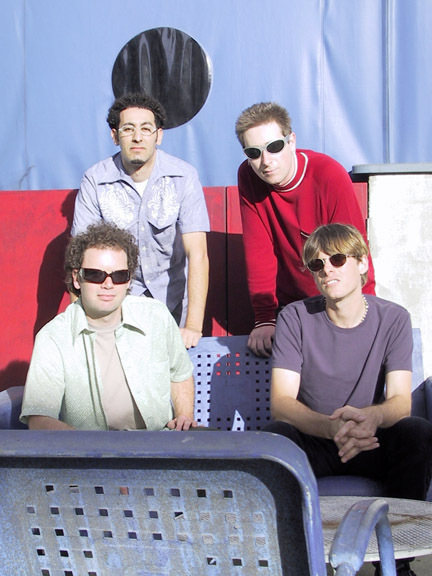 Summercamp formed and honed their art in the thriving music community of Santa Barbara,California--well known for its lively college scene playing with local faves like Dishwalla, Toad The Wet Sprocket and Nerf Herder, among others. Band members Tim Cullen and Sean McCue--who share singing and songwriting duties--hooked up in high school and later recruited bassist Misha Feldmann, completing the line-up with drummer Tony Sevener in 1994. "The cool thing about Santa Barbara is the diversity of music going on," says Misha. "There is a big music scene, but there's not just one sound. Everybody's going with their own thing and the musicians are all supportive of--not competitive with--each other." Alternative rock quartet Summercamp hail from the picturesque beach community and thriving music scene of Santa Barbara, where, in 1987, vocalist/guitarists Tim Cullen and Sean McCue met in high school. Another fellow student, bassist Misha Feldmann, joined after graduation, and once Drummer Tony Sevener signed on in 1994, the line-up was complete. The band issued their 1997 debut LP, Pure Juice. They charted with the single �Drawer� and toured the US, Europe and Japan in support of their release. For the next album, Summercamp began recording at a rustic 24-track studio nestled on 38 acres in Santa Ynez Mountains near Santa Barbara; with producers Gil Norton (Foo Fighters, Pixies) and Chris Sheldon (Foo Fighters, Feeder). Additional recording and mixing took the band to Los Angeles, New York and London, England. Drummer Ramy Antoun has since replaced Sevener and the new line-up is finishing their second album with producer Luke Ebbin (Bon Jovi, Rival Schools).